Rating: 86 percent based on 876 votes. Description: Grab your bow and arrows, take aim, and let loose as you try and hit the bullseye of the target to complete each level. Each level adds a new challenge such as stronger wind or a farther target. 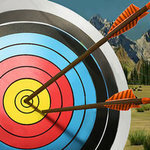 Mouse: Click to aim and shoot the arrow.